You enjoy the good things in life — spending time with friends and family in your contemporary home designed with entertaining in mind. 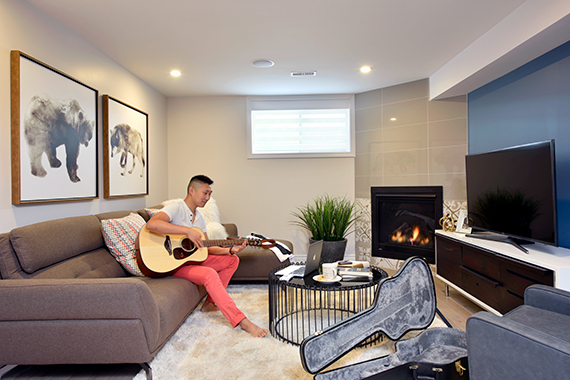 The Monterey is the latest of Minto's Executive Townhomes, boasting a light-filled, open-concept main floor. 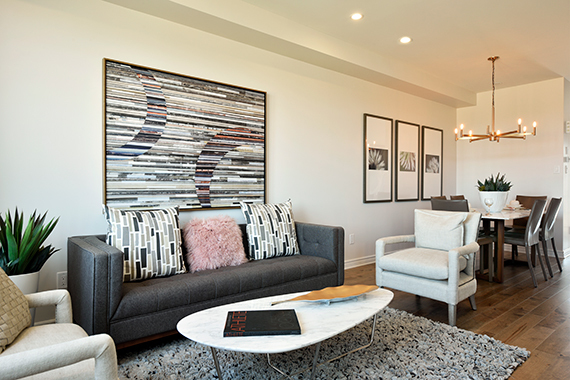 This is a home that blends new and old — the nine-foot ceilings and open floorplan is a picture of modern design, while the maple floors and more traditional finishes harken back to the quality and luxury of times past. The Monterey Townhome has a kitchen designed for someone who loves to cook and spend time entertaining. Yes, you’ll appreciate all the storage space in the traditional shaker cabinets and the large, durable quartz countertop, but even more appealing is the beauty of the space. The warm grey of the counter, the cool cream of the cabinetry, the trendy glass backsplash — how could you not spend as much time in the kitchen as possible? It's also just steps away from the formal dining room, where you can dine in style. 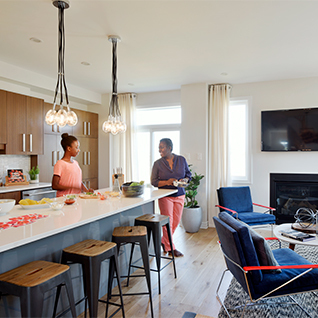 The sun-filled living room is open to the kitchen and dining room, encouraging sharing and conversation. Rich maple floors and comfortable chairs and couches in warm tones make this a very welcoming space. Consider that corner fireplace a must-have! Warm things up even further with an area rug and lots of pillows, and this great space features a laminate wood floor — making it both attractive and durable. Gather with friends or family around the intimate dining room table enjoying a home-cooked meal before heading to the entertainment room downstairs, turning on the luxe corner fireplace to add a warm glow to the room. The Monterey is designed with a small family in mind. Perhaps you've just started a family or are in the process of downsizing, with kids away at college or university. 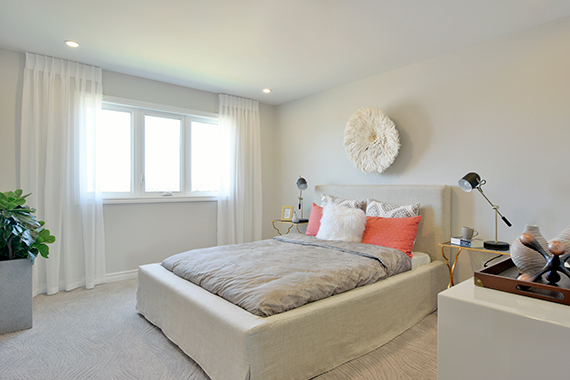 You can still have the generous master bedroom and ensuite you've always wanted while modifying the second and third bedrooms to suit your lifestyle. The generous master bedroom and ensuite beckons at the end of a long day. The warm tones of the room create a relaxing haven. What better way to unwind than in that deep soaker tub, or perhaps you're heading to the theatre with just enough time for a quick shower? Step into your modern glass-walled shower and feel instantly rejuvenated. Your master and ensuite is just steps away from the upstairs laundry — how convenient! The two remaining bedrooms can be styled as guest rooms, but are also suitable as a home office or library. A large window in the basement makes this room feel bright and welcoming, while the gorgeous corner fireplace ensures it's always cozy. This is a room perfect for family gatherings or an intimate evening for two. The large window makes this finished family room bright and welcoming. You'll never be cold — not with that magnificent area rug. Turn on the corner fireplace and tune in to a movie or good book. 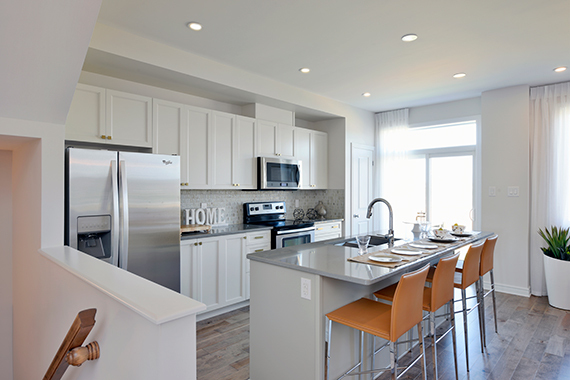 You can find the Monterey Executive Townhome Model in Avalon Encore, Orléans. 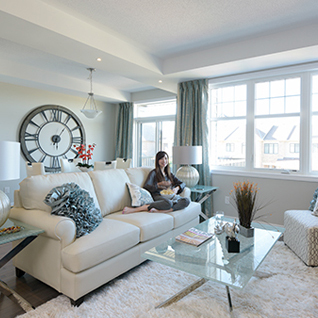 Visit our stunning collection of Model Homes in Arcadia in Kanata and Avalon Encore in Orléans and discover Minto's new designs for yourself. 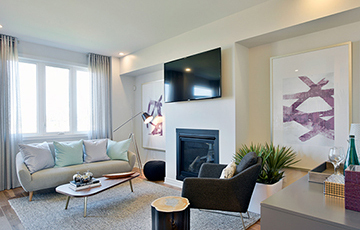 Finishes, flex plans, and décor described are unique to this Monterey Executive Townhome Model Home, and may include features that are additional investments through the Minto Design Centre. Availability is subject to change without notice.